Hillside villages along the Mediterranean coast don't come more picturesque than Eze, attracting vacationers with its perfectly preserved medieval streets, colorful botanical gardens, and sweeping sea views. Offering a refreshing alternative to ultra-fancy places like Cannes and St. Tropez, a holiday in Eze presents a chance to step back in time and imagine how the Mediterranean looked before the area was commercialized and turned into one of world's most popular destinations. Vacations in Eze appeal in particular to honeymooners, who come to make the most of the romantic setting and excellent views. Eze is in French Riviera - Cote d'Azur. 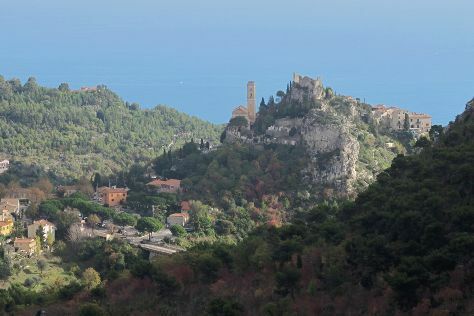 Plan your trip to Eze and other France destinations using our handy France trip itinerary maker website . The tricky hillside location of Eze makes accommodations within the town itself fairly limited. You can stay at some memorable hotels, many housed in traditional buildings with remarkable views of the Mediterranean. For something less expensive, stay at one of the bed and breakfasts or vacation rentals close to the main road, just a stone's throw from the main attractions.